***FREEBIE*** This is SET #3 of SCOOT! SHORT VOWELS ! 24 TASK CARDS!!! 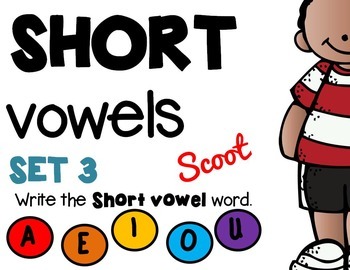 A fun alternative to worksheets to review short vowels. SCOOT is an easy, fun, fast paced game that will get the kids up and moving around. Place a task card on each desk in numerical order. Each student will read the sentence and will write down the SHORT VOWEL WORD on their sheet. Then after a minute or two, say "SCOOT!" and the students will SCOOT over to the next seat and get started on the next question straight away. Tips and directions are included. BONUS! 6 Brain Breaks/Teasers are included too! Which are to be used when you have more than 24 students. Blank versions are available as well where students can choose what they want to do.